1. 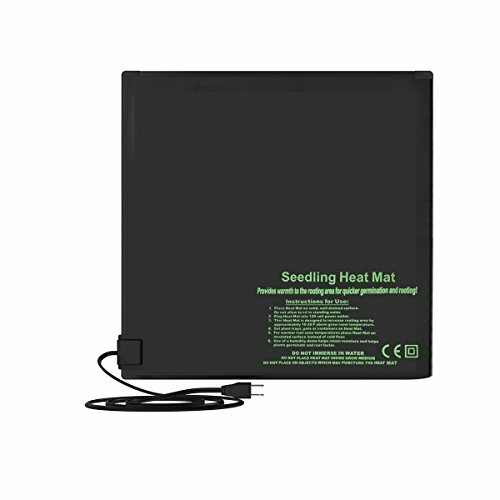 Seedling heat mat is made from heavy duty PVC material, IP67 standards construction, with heating wire inside. 2. Durable construction, waterproof and easy cleaning, which is ideal for greenhouses, nurseries, and indoor gardens. 3. Warms root area 10-20°F / 5-11°C over ambient temperature; Improves germination process and increases the success of seedlings and cuttings. 4. Can be placed in many different sizes of seedling bowls. 1. Locate a flat, dry surface of the appropriate size for your heat mat. Avoid cold surfaces, and they will counteract the heating ability of the heat mat. 2. Plug the heat mat's power cord into a standard 120-volt outlet. 3. Place a propagation tray or other plant container on the heat mat. For best results, cover seedlings/cuttings with a humidity dome. Failure to observe the following safety guidelines may result in fire, electrical shock and / or damage to the heat mat. 1. Never allow the heat mat to become submerged in water or any other liquid. 2. Don't place the heat mat on or under any other heating, warming or insulating device. 3. Don't place the heat mat on rough or pointed surfaces, as this can damage it. MATREIAL: Seedling heat mat is made from heavy duty PVC material, IP67 standards construction, with heating wire inside. ADVANTAGE:Warms root area 10-20°F / 5-11°C over ambient temperature; Improves germination process and increases the success of seedlings and cuttings. USAGE: Can be placed in many different sizes of seedling bowls. If you have any questions about this product by Oppolite, contact us by completing and submitting the form below. If you are looking for a specif part number, please include it with your message.